Full sized hair dryer are great but are not always convenient, especially when traveling. If you’re worried that using a compact hair dryer won’t give you the same fast, effective results as a full sized one, think again! Compact hair dryers offer a lot of the same benefits in a smaller package for a lower price. Whether you’re looking for anything from ionic to tourmaline, there’s a compact hair dryer that can give you just want you want. Ionic shine is a term that’s often associated with this and other styling tools, but what exactly does it mean? What does this Conair Ion Shine Travel Styler do that other hair dryers don’t? Well, it’s all about the chemistry. An ion is a charged particle that’s either positive or negative. A positive neutralizes a negative and vice versa. When your hair is wet, the water in it carries a positive charge. Ionic hair dryers emit a negative charge which breaks the water into smaller particles. This in turn helps it dry faster. The ionic elements to this and other styling tools don’t actually interact with your hair itself; rather, they interact with the product in your hair. What does that mean exactly? They really can help some products work better and do indeed cut drying time. So, we know that the Conair Ion Shine Travel Styler really does what it says it will. It can dry your hair faster because of the ion technology. But there’s so much more to it. There are two different heat and speed setting so if you have thin hair that doesn’t need a lot of air or thick hair that does, it will work for you. There’s also a cool button so you can set your style. It’s much smaller than a traditional hair dryer and the folding handle makes it a safe saver when you’re packing for a trip. But what makes it a great compact hair dryer and easier to travel with is this: it has dual voltage so it’s easier to take it with you on your next trip around the world. Just change the voltage by using the easy to follow directions, make sure you take a European voltage adapter with you, and you will surely look great on your next trip abroad. If you’re not concerned with a fast dry time because your hair is fine or if you just want something a little more basic, consider the Conair Vagabond Compact. It’s not ionic but it definitely gets the job done. There’s two heat and speed settings so you can choose what works best for your hair. A cool shot button lets you set your style when you get it just right. What makes it great for travel? The folding handle makes it even more compact so you can easily pack it in any suitcase. It has a dual voltage setting – all you need to do is turn the dial with a coin or screwdriver and plug it into an outlet adapter when you’re travelling abroad and you’ll get the same reliable performance that you do at home. The cord is a decent length – 5 feet to be exact. Having a long cord is a nice feature to have for travel because you never know how far away the outlet will be from the mirror. Because it’s not ionic, it might take a little while longer to get your hair dry so if you have thick or curly hair, this might not be the best choice for you. It also doesn’t last as long as you might hope. For the price, though, even if you only bought it to travel with, it’s still a really good deal on a solid little hair dryer. What is tourmaline? Well, it’s the little something extra that makes this hair dryer a great buy. Tourmaline is a semi-precious mineral. 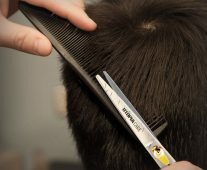 When it’s heated, it puts out a lot of negative ions and closes the hair cuticle, making it really smooth. Tourmaline hair dryers cost just a bit more than ionic ones, with good reason. Tourmaline is a rare gemstone so the price will reflect how much is integrated into the dryer. You might be wondering, is tourmaline any better than ionic? It depends. If tourmaline is integrated into the internal components rather than just a thin coating, it will be more effective. In fact, there are reports that it can dry your hair up to 40% faster. 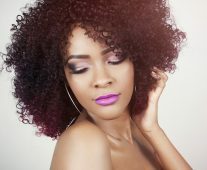 It also helps your hair tolerate higher levels of heat without creating as much damage as a different hair dryer would. When you’re traveling, the last thing you want to do is spend a lot of time fixing your hair. With this hair dryer, you can get the same great styling in half the time so you can get out the door to start sightseeing sooner or just stay in bed a little bit longer. It also compact and has a folding handle to make it easier to pack than a full sized hair dryer. With two speed setting and easy dual voltage adjustment, this hair dryer can help you have a good day wherever you are. 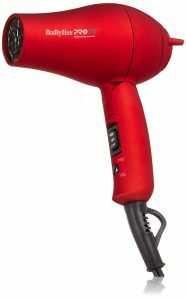 This compact hair dryer from Revlon offers all the features of a full sized hair dryer in a much smaller package. It has ionic technology so you’ll be able to dry your hair faster and spend more time enjoying your travels. The dual voltage adjustment is easy to change and lets you use it in a lot of places around the world with the right outlet adapter. Another reason it’s great for travel? The folding handle helps you tuck it right into your luggage, gym bag, or carry on without taking up a lot of room. The triple ceramic design is also impressive for a compact hair dryer. Ceramic is a clay-like material that is used in the body of the hair dryer. It creates infrared heat that can get directly into the hair shaft to help maintain its natural moisture and shine. Because of the way ceramic handle heat distribution, this hair dryer isn’t too hard on your hair and prevents some of the damage usually associated with blow drying. With two heat/speed settings, this hair dryer will work quickly on almost any hair length and texture. There’s even an airflow concentrator that helps focus the air so you can get it as smooth and sleek as you want it. No matter what hair dryer you use, make sure to read our tips on how to avoid common hair drying mistakes. 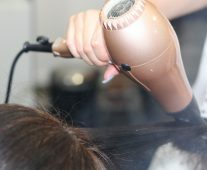 You might also want to check out our list of the best quiet hair dryers if bothering roommates or family members is a problem at home.